Most online casinos offer bonuses, especially when new users sign up and this bonuses has 1 most important rule – wagering requirements. Generally when you join a new online casino, you will receive a matching bonus on your first deposit. The amount can range from around 25% to 500% or more. So, if you deposit $100, you could get $25 for free, or up to $500 for free, maybe even more. Each bonus is different, so it’s important to read the terms and conditions. And yes, most of the crazy bonuses have catches. Especially with the 200%+ deposit bonuses, there’s always some sort of catch. Pay attention when signing up for a new casino, and make sure that you understand the terms of the bonuses offered. The most common “catch” with casino bonuses is wagering requirements. These wagering requirements vary quite a bit depending on the casino and the bonus offered. For instance, a 200% deposit bonus might require that the deposit and bonus be wagered 30 times before you can cash out. So, that means that if you deposited $100, you’d get $200 free, totaling $300. However, that $300 would have to be wagered 30 times before you could withdraw any money. So, you’d have to bet $9000 worth in bets before withdrawing. That might sound bad, but it’s not as horrible as it sounds. As long as you do decently and don’t just lose all your money in the beginning, you’ll be able to reach the wagering requirements after a few hours of game play. If the deposit bonus is less, say 50%, then the wagering requirement may only be 5 or 10 times the deposit + the bonus. Other casinos only have wagering requirements on the actual bonus, meaning you can withdraw the cash winnings from your actual deposit at any time. It may seem like deposit bonuses are scams, but think about it: online casinos are businesses too, and they have to produce revenue, and ultimately, profit. There’s no way a real casino could match your deposit by 500%, so you shouldn’t expect an online casino to do the same without a catch. A lot of online casinos have the option to opt-out of the deposit bonus, in case you don’t want to have any complications with early withdrawals. A lot of casinos have smaller, normal deposit bonuses after the initial one too. These are usually much smaller, like 10-50%. The nice thing is they might still have wagering requirements on these smaller bonuses, but they won’t be nearly as sever. 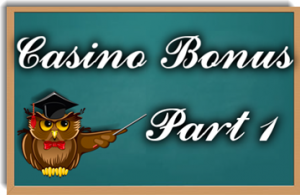 Generally you can keep getting bonuses as you continue to deposit money, but like I said, you should look into the bonuses on the specific casino you intend to sign up for. All the information for casino bonuses can usually be found under the “promotions” or “cashier” tab on the casino website.